Searching for a refreshing location for your next corporate meeting, gala dinner or a one-off social event or incentive? Are you looking for activities for your Sports & Social Club, deals for your Employee Incentive Programme or for team building? Look no further than Ireland’s Most Beautiful House! For private and corporate entertaining to high level business meetings, Westport House offers the perfect retreat. It is an ideal venue to entertain clients, partners and employees, to work on strategy or celebrate a professional milestone. From a board meeting to an afternoon of activities to a magical evening event, our world-class staff and our unique heritage setting support your professional and business goals. Give Your Lunch or Dinner Event the WOW Factor. At Westport House, we have a variety of great rooms in which you can host your exclusive event. Whether it’s an intimate dinner for 10 people or a larger celebration for 120 people, we have a room to suit all moods and occasions. Choose a private dining room such as the Drawing Room overlooking the front lawn, the impressive Long Gallery where you’ll be surrounded by portraits of the Browne family or enjoy the Wyatt-designed and most formal room in the house, the Large Dining Room. If you’re looking for something more informal – consider the lovingly restored Old Kitchens. Portwest recently celebrated the retirement of VIP employee, Stephen Mogford, with a special dinner at Westport House. Check out the video. With our reputation for fabulous food, we work hard to source regional and artisan foods locally and prepare and present them with flair and the utmost flavor. Consider us for a luncheon, formal dinner, buffet supper, afternoon tea or networking reception! 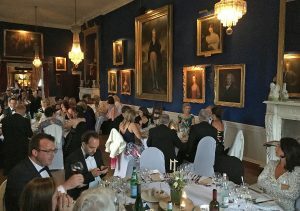 We would be delighted to arrange some dazzling entertainment – choose from an array of live music acts, Irish dancing displays, sheep herding trials, interactive receptions with local food producers, Murder Mystery Night, Mentalist or Magic Shows. Think Outside the Box. Host your Meetings with us. 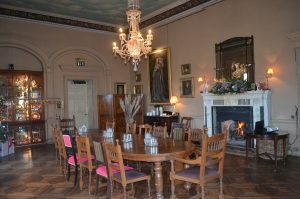 For meetings and seminars, experience the impact of a wonderful Board Room feel in the drawing room at Westport House (capacity from 10 people to 80 people). Or bring your larger group to the Long Gallery where you’ll be surrounded by the beautiful antiques and paintings of the house (capacity 120 theatre style). All modern electronic equipment is available for your presentations. The Drawing Room offers a full size antique board table with original and comfortable chairs. The original furnishings, 19th century Sky Ceiling by Wyatt and world-class parquet floor all provide the sort of atmosphere that leads to real entrepreneurial “out of the box” thinking. Break out spaces are available for smaller groups throughout the house. If you’re looking for complete privacy for more intimate meetings and conferences, exclusive use of the House may be arranged if required. 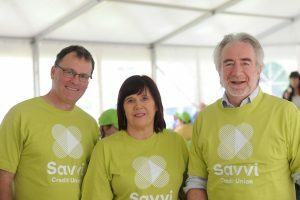 SAVVI Credit Union Team at their Customer Appreciation Day in August welcoming over 850 guests for a family fun day out. We can arrange an exclusive rental of the Pirate Adventure Park for your team day out or Family Fun Day as well as offer the A to Z of adventure activities for team building. If you have an employee benefit programme or sports & social club, contact us to see what offers we can extend to your team. If there’s something specific that you have in mind, just let us know and we’ll surely source it for you! We had the pleasure of hosting a Customer Appreciation Event in August for SAVVI Credit Union – a massive success with over 850 customers coming to visit. We were tickled pink to receive comments such as “Big thanks to you and all your staff for a fantastic day on Saturday – the smiles on the kids’ faces told it all and we had numerous compliments from the parents about what a wonderful day they were having. Your professionalism and attention to detail made our job a lot easier and meant we could relax and enjoy the day ourselves.” Read all about the SAVVI Customer Appreciation Day here. Set on a 400 acre estate in the heart of the heritage town of Westport, built it in 1730. Unlike many modernised historic homes, it still retains all the original character and charm, allowing you to go back in time to the 18th Century. We can happily provide a brief talk or guided tour as part of your event to give your guests a “sense of place”. The team at Westport House put all of their energy and professionalism into making sure that every one of our clients have a magnificent experience. Join us for a meeting, stay for lunch or dinner or simply visit us for team building. Check us out on Google Street View!